was never interested in printing, the first thing I’d say when I came in to the studio in the morning was ‘I’m not interested in letterpress printing, I’m interested in what you can do with this stuff’” says Alan Kitching, one of the world’s foremost practitioners of letterpress typographic design and printmaking. Renowned for his expressive use of wood and metal letterforms in creating visuals for commissions and limited edition prints Kitching lives and works at The Typography Workshop in Kennington, south London, which he shared with designer, writer and partner Celia Stothard (deceased 2010). To celebrate him, Laurence King published a long-awaited monograph that documents the work of this amazing practitioner Alan Kitching. Spanning over fifty years, this lavish volume leads us from Kitching’s first typographical experiments under the auspices of mentor Anthony Froshaug to his most iconic creations at The Typography Workshop. It covers his years designing alongside Derek Birdsall, as well as his time teaching letterpress at the Royal College of Art, and showcases his most colorful and expressive pieces, including his prolific work for The Guardian. Kitching’s work hangs in private collections and galleries but it has also featured on everything from magazine and book covers, postage stamps and theatre posters, to wine labels, billboards and signage. The appointment came at a perfect time for Kitching, professionally, personally and historically. 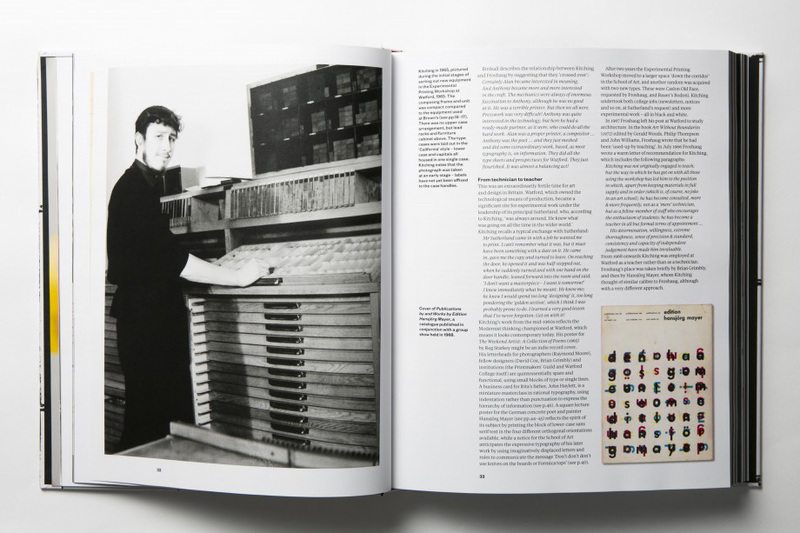 It brought him into contact with a large number of ambitious students, many of whom would go on to have considerable impact on the British graphic design world (and later the international scene) over the following decades. They included Andrew Stevens and Paul Neale of Graphic Thought Facility, Henrik Kubel and Scott Williams of A2/SW/HK, Maja Sten and Maki Suzuki of Åbäke, Michele Jannuzzi and Richard Smith of Jannuzzi Smith, Silke Klinnert of Wink, Jonathan Barnbrook and Anthony Burrill. The Swiss designer Michele Jannuzzi recalls researching the RCA’s tutors and coming across Kitching’s name: “It was in the pre-internet era and the pictures one could gather were scarce, but what I did find in the library immediately spoke to me [in] a language of boldness, clarity and excitement.” When he came to London to study at the RCA, Jannuzzi showed Kitching his work: “With patience, Alan sat me down and, one by one, unpicked all the names of the designer-typographers I was trying to imitate in my work. It was just a simple list of names that ended with something that sounded like: ‘D-yo-r-own-thin-.” Although Jannuzzi found it difficult to understand Kitching’s north-eastern accent, the admonition that he ‘do his own thing’ rather than copying his heroes has stayed with him. A Life in Letterpress by John L Walters is published in two forms by Laurence King: a Collector’s Edition. The priced £200, limited edition of 200 copies only, includes a hand printed letterpress signed print, numbered and wrapped round the book to form a jacket. More info is at laurenceking.com.